ISTANBUL - The Republic of Turkey, represented by the Literary Work Owners Society of Turkey (ILESAM) publishing house, started printing, publishing and distributing the ‘Talal Ibn Adeebeh’ story in Turkish to various educational and cultural institutions and libraries in the country. Turkish writer and researcher in children’s literature, Ms. Melike Günyüz wrote the preface of the story, while the text of the Story was edited by author and art critic at Turkey’s Ministry of Culture Mr. Ümit Yaşar Gözüm. Gündüz also noted that this story comes at an appropriate time during which the world is in urgent need for such inspirational role models to enhance hope for the future. The Republic of Turkey, represented by its people and government, is one of the countries that gives much attention to the Palestinian cause, especially refugees and their suffering and the ability of the Palestinian people to successfully surpass obstacles and excel to achieve tremendous success. The life of Chairman of Talal Abu-Ghazaleh Organization, HE Dr. Talal Abu-Ghazaleh, is the best testament to this. Talal Ibn Adeebah story, approved and adopted by a number of ministries of education in the Arab region to be distributed to schools and libraries, chronicles the story of Dr. Abu-Ghazaleh from his childhood during which he was forced to leave his homeland to the achievement of great success. The story presents future generations with lessons for success against obstacles and challenges faced by the Palestinians and demonstrates how to achieve glory despite suffering. 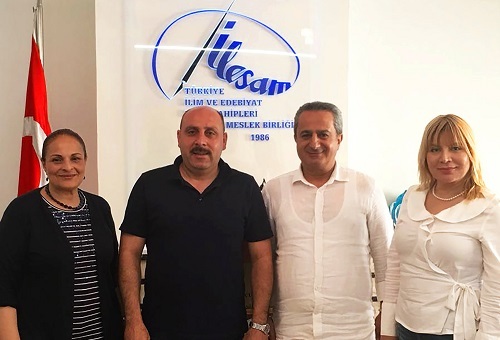 It’s noteworthy to mention that the Professional Turkish Union of Scientists and Writers (ILESAM), a semi-official Turkish institution that gathers more than 2500 writers, academics, thinkers and intellectuals, is chaired by Mr. Mehmet Nuri Parmaksız.